Okay, sorry I couldn’t come up with a better title. Truth is, I haven’t posted in such a long time, I think I am beginning to forget how. So, as those who have followed this blog know, my culinary options have been severely limited since I was diagnosed with a dysfunctional gall bladder. Long story short, I was put on a severely restricted diet. “But how will I continue to post delicious recipes to my blog?” I wondered. I thought that I could become a pro at new styles of cooking overnight. This is around the time I picked up 50 hours of work a week. Suffice it to say, my cooking has taken a hit. The few things that I did actually cook were not worth posting. I am still finding my way around new flours, new sweeteners, and the like. So, until I master new cuisines and the health food world, I have become determined to post things I already know are delicious, even if I am not cooking with them currently. Luckily, I have started to reintroduce some things into my diet (although this will have to be rolled back again when I eventually do get my surgery). So recipes should be forthcoming in the relatively near future, because I can use familiar ingredients again. Now, then. On to today’s yummy “Global Food Fusion” lesson: preserved Armenian walnuts. Unlike Georgian recipes, in which walnuts are chopped up and used for sauces, Armenians preserve their walnuts for a sweet treat. These little gems are picked when they are young and still green in the plains below Mount Ararat (aka Masis to Armenians, and yes–it’s the same Mount Ararat on which Noah is said to have landed the Ark). They are preserved whole (as the shell is still soft) in a sweet, thick syrup. These have finally become readily available in the US, and not just at local import stores. You can buy a jar for $10 at Harvest Song’s website. Click here for more info. From Harvest Song's website. Yes, I really was too lazy to go to my fridge and take a picture of my own jar and upload it here. Sorry. Armenians generally eat a few of these delicious morsels solo for breakfast or for dessert, with a cup of tea. They are also a wonderful and special treat for house guests. However, as a recent New York Times blurb points out, we can use them as delectable ornamentation for pies, or as a unique addition to cocktails. 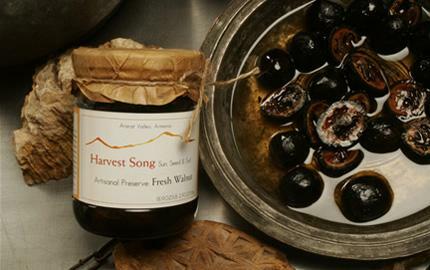 Really, preserved Armenian walnuts can be used any time a slightly crunchy sweetness is desired. Me? I don’t need a special occasion or recipe. I sort of just inhale them directly from the jar. I just try my best not to consume the entire thing within a week.